A man who had been shut out of a pub terrified staff and customers by throwing a Buckfast bottle through the glass front door. The door pane shattered, injuring a barmaid and covering the people who were holding it shut with shards of glass. Minutes earlier, a court heard, Lee Mullen had screamed and shouted abuse through the door of The Crown Arms in Linlithgow, West Lothian. Alistair Macleod, prosecuting, said he and another male had appeared in the doorway of the bar at drinking-up time. Mr Macleod told Livingston Sheriff Court that barmaid Nicola Hardie told the pair that last orders had already been given and the pub was closed. The male with Mullen shouted back: “It doesn’t f***ing look like it!” Mullen then started challenging customers inside to fight. 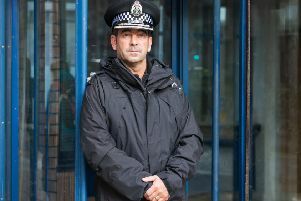 Mr Macleod said: “Miss Hardie walked over to the accused and pushed him out of the door but the accused pushed the door again while shouting and screaming aggressively.” Miss Hardie continued pushing at the door to keep the accused out and, on seeing her struggle, several other customers assisted and eventually closed the door. The court was told that, a short while later, a glass within the door was smashed and a bottle of Buckfast thrown into the pub. Mullen, 24, of The Vennel, Linlithgow, appeared for sentence at Livingston Sheriff Court yesterday. He earlier pleaded guilty to causing a disturbance and throwing the bottle during the incident on May 2 last year. Sheriff Iain Duguid QC placed Mullen under supervision for a year. Mullen was also ordered to do 180 hours of unpaid work in the community and electronically tagged under a 7pm to 7am curfew for six months.